Robert M. Gates '65, L.H.D. '98, was named twenty-fourth Chancellor of William & Mary by the Board of Visitors at his investiture on February 3, 2012. He succeeded Sandra Day O'Connor, former Associate Justice of the United States Supreme Court, who was appointed in 2005. He was re-invested for a second term on February 8, 2019. 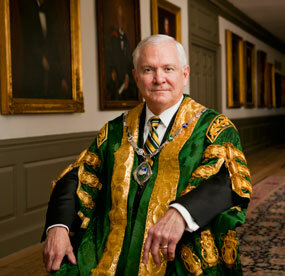 Chancellor Gates is the first alumnus to hold this position in William & Mary's modern era. As U.S. Secretary of Defense from 2006 to 2011, he became the only person in American history to serve under presidents from different political parties. In his words, William & Mary instilled in him "a calling to serve—a sense of duty to community and country that this college has sought to instill in each generation of students for more than 300 years." Chancellor Gates began a career in public service soon after his graduation from William & Mary. In 1966, he joined the Central Intelligence Agency, working for six presidents during nearly 27 years as an intelligence officer. During this period, he was a National Security Council staff member for nine years. Gates is the only career officer in the CIA's history to rise from being an entry-level employee to become the agency's director, a post he held from 1991 to 1993. He was Deputy Director of the CIA from 1986 until 1989 and Assistant to the President and Deputy National Security Adviser at the White House for President George H. W. Bush from January 1989 until November 1991. On December 18, 2006, Gates took office as the nation's 22nd Secretary of Defense under President George W. Bush. When inaugurated in January 2009, President Barack Obama asked Gates to continue in office. In June 2011, Gates retired as Secretary of Defense. At the farewell ceremony, President Obama awarded him the Presidential Medal of Freedom, the country's highest civilian honor. He has also received the National Security Medal and the Presidential Citizens Medal. Gates was awarded the National Intelligence Distinguished Service Medal twice and the Distinguished Intelligence Medal, the CIA's highest award, three times. Gates' first book, From the Shadows: The Ultimate Insider's Story of Five Presidents and How They Won the Cold War, was published in 1996. In 2014, he published his second book, Duty: Memoirs of a Secretary at War, which was described as "one of the best Washington memoirs ever" in the New York Times and topped its list of best-selling non-fiction books for five consecutive weeks. His third book, A Passion for Leadership: Lessons on Change and Reform from Fifty Years of Public Service, was published in 2016. A history major at William & Mary, Gates was an active member of Alpha Phi Omega, a service organization that he led as a senior. Gates was also a dormitory manager and orientation aide as well as the business manager of the William & Mary Review, a literary and art magazine. At graduation, he received the Algernon Sydney Sullivan Award, given to honor splendid characteristics of heart, mind and helpfulness to others. Chancellor Gates' ties to his alma mater run deep. He has been a trustee of the William & Mary Foundation Board and spoke at Charter Day in 1998 and again in 2013 as well as at Commencement in 2007. He received an honorary Doctorate of Humane Letters from the university in 1998 and the Alumni Medallion, the Alumni Association's highest honor, in 2000. A native of Kansas, Gates earned his master's degree in history from Indiana University and a doctorate in Russian and Soviet history from Georgetown University. From 2002 until 2006, he was president of Texas A&M University. An Eagle Scout himself, Gates was elected to a two-year term as national president of the Boy Scouts of America in 2014. Bob and his wife, Becky, live in Washington state.